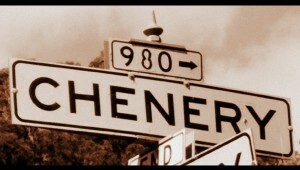 Chenery's namesake has an entrepreneurial history in early San Francisco, and California. If you’ve ever ventured to the village of Glen Park in San Francisco to experience a fine dining establishment, or ambled your way to Nature’s respite in Glen Canyon, you’ve likely crossed paths with Chenery Street. Beginning near 30th and Church, Chenery Street runs the length of Glen Park. It follows a U-shaped route along the southerly base of the City’s central peaks, terminating at Elk Street adjacent Glen Canyon. Chenery Street appeared on a map detailing the Fairmount Homestead Association in March 1865, identified as the tract’s eastern boundary. In the early 20th century, with too many San Francisco streets having the same name and other streets with sudden name changes every few blocks, the Street Names Commission of San Francisco attempted to clear up the confusion. As a result, Glen Avenue, an extension of Chenery Street between Diamond and Elk Streets, was renamed Chenery Street in 1909. Books about the history of street names in San Francisco tend to exclude any discussion of Chenery Street. This leaves us to wonder who, exactly, was Chenery and what were the accomplishments that led to such an honor? Richard Chenery was born June 20, 1817 in Montague, Massachusetts to Nathan Chenery and Sophia Gunn. He was a descendent of Lambert Chenery, an emigrant from England who landed in Salem, Massachusetts in 1630. Members of this preeminent New England family would later be veterans of the French and Indian Wars, the American Revolution, and the Civil War. After living in New York City for three years, Chenery set out for the Wisconsin frontier, settling in Spring Prairie, Walworth County. At the age of 22, he was nominated for Walworth County assessor. He returned briefly to Massachusetts to marry Sarah Ann Peck on August 15, 1839. After returning to Wisconsin Territory to start a family, they eventually made their way back to Massachusetts. With news of the discovery of gold in California having been received in Massachusetts, Richard Chenery was elected captain of the Holyoke Northampton Mining Company. Bound for San Francisco, they departed Northampton, Massachusetts on February 5, 1849 with great fanfare from friends and neighbors. They took the train to New York where they boarded the S L Crowell and sailed for Chagres, Panama. Reported to have personally carried 50-pound packs while tramping across the disease-ridden isthmus, the group was temporarily stranded on the Pacific coast until they could gain passage on the Copiapo, finally arriving in San Francisco on August 8, 1849. This must have resonated with Chenery because, after making their way to Sacramento, Chenery became proprietor of the Globe Hotel. Starkweather noted The Globe served salmon “at nearly every meal” because they were so abundant in the Sacramento River. Chenery also acquired an interest in the National Hotel near Washington and Montgomery in San Francisco. Chenery was the proprietor of the Sacramento Store Chenery & Hazeltine. As if running hotels failed to keep him busy enough in the raucous 1850s, he also became proprietor of Chenery & Hazeltine at the corner of M and Front Street in Sacramento, and later the Brick Store near K and Front Street. Numerous newspaper announcements alerted Forty-Niners of the arrival of supplies ranging from chili flour, to 20,000 pounds of potatoes, to iron bedstands, to church clocks. Chenery also advertised that the steamer Excelsior and the barge Calvin, docked at the foot of J and K Street on the Sacramento River, were available for freight or tow to Marysville. The Calvin was capable of carrying 25,000 feet of lumber upriver. He also maintained a store ship, the Crescent, as a powder magazine. In January 1852, Chenery sold his full interest in the business to Hazeltine and soon focused on the sale of “Flour! Flour! Flour!” (as one ad in the Sacramento Daily Union shouted), produced by “the celebrated” Chenery & Lambard Mills, and Chenery, Reddington &Co., both at the corner of I and Second Streets in Sacramento. In March and May of 1852, Richard Chenery had the cash on-hand to provide 100,000 pounds of beef to feed the Pomo Indians, who were confined to reservations at Russian River and Clear Lake. The Indians were so destitute that they threatened “hostilities and plunder of the white settlements” if their request for beef was not met. The local agent of Indian Affairs had not received any appropriations from Congress to deliver their request and asked Chenery for help. Chenery stepped in and provided the full amount at a cost of $8,000 (about $205,000 today). Congress approved full reimbursement to Chenery in 1863. The California Steam Navigation Company was formed to last the duration of fifty years, starting with capital in the amount of $2.5 million (the equivalent of nearly $60 million in 2012). Chenery was elected its first president, served on the board of directors, and also served as agent at San Francisco. Its steamers included the Antelope, New World, Eclipse, Queen City, and Chrysopolis, all of which carried Pony Express mail from Sacramento to San Francisco, and frequently transported the famous Lola Montez to and fro. Dividends were paid to stockholders monthly. Fares from San Francisco to Marysville were raised to $12 per cabin, and freight $15 per ton, while passage from San Francisco to Stockton was $10 per cabin and $6 per ton. Concern was expressed about the advantage such a “mammoth company” would have to the people it served, especially when fees could be raised at whim. Eventually, the state Supreme Court stepped in to restrain the monopoly. Chenery was next elected to the California Assembly in 1857 and served for one year. During his tenure, he co-introduced a resolution amending California state law regarding the rights of husbands and wives, resolving that if either were to be found guilty of adultery, they would have no rights to any portion of the common property. In 1859, Chenery was a contractor for the Central California Railroad, whose engineer was Theodore Judah. The railroad was to run from Folsom eastward as an extension of Judah’s Sacramento Valley Railroad, the first railroad in California. During the Civil War, Chenery was appointed agent and acting pursor of the United States Navy for the Port of San Francisco in July of 1861. (View a document signed by Abraham Lincoln appointing Chenery Navy Agent.) His office was located at 808 Montgomery Street. He was alloted $2,728.50 for disbursement to sailors in San Francisco, a paltry sum compared to that received by New York and Boston that were closer to the war front: $590,532.35 and $452.002.12, respectively. With the War ongoing and his continued interest in the expansion of transportation opportunities for California, Chenery became a contractor in March, 1862 for the California Northern Railroad, to run between Marysville and Oroville. In January 1863, he became a member of the board of directors and treasurer for the Pacific Railroad Company, connecting the San Francisco and San Jose Railroad in San Jose by running new track through Alameda, Contra Costa, and San Joaquin counties to Stockton, then to the Central Pacific Railroad in Sacramento. Whether Chenery’s true intentions were fraudulent, or if he was unknowingly enveloped in a situation that got out of hand will never be known. Given that a street was named after him only two years later, it seems he came out of it unscathed with his integrity intact. During these eventful times, Richard Chenery experienced extreme personal sadness. His son, Lieutenant James Perry Chenery, after having survived battles at Antietem, Fredericksburg, Chancellorsville, and Gettysburg, died at Northampton, Massachusetts March 22, 1864 of dysentery contracted during his service. Richard’s wife, Sarah, died in San Francisco the same year, on November 23. The next summer, on July 8, 1865, the Vigilante days of San Francisco returned in a brief flashback. Billy Mulligan, previously expatriated by the 1856 Vigilance Committee, was shot dead by San Francisco Police Officer Mortimer Hopkins during a commission of a crime. As a juror, Chenery signed the verdict of the inquest, finding that Officer Hopkins had acted under discharge of his duty. This brings us to an interesting note. Richard Chenery was referred to as Colonel Chenery from his early years in California to his death. A genealogical history of New England families states, “He was one of the organizers of the celebrated military Vigilance Committee of San Francisco, whose work is a matter of history, and for able service was elected chief officer with the title of Colonel.” However, a search of membership lists in records for both the 1851 and 1856 San Francisco Vigilance Committees, as well as written histories and newspaper accounts, found no mention of Chenery. The same was true for similar committees in Sacramento. Additional research to determine the origin of Colonel is required. In 1865, just a few years before the completion of the Transcontinental Railroad (1869), Chenery arrived in New York, disembarking from the Ocean Queen from Aspinwall (Colón), Panama. Also onboard was a Who’s Who of the Pacific Coast: Judge Field of California, a member of the US Supreme Court; Horace Carpentier, President of the Overland Telegraph Company; AB Cheesman, President of the US Mint; EM Jenkins of the Pacific Mail Steamship Company, and William Parker, Superintendant of the Panama Railroad. The exact nature of their visit was not disclosed. In 1869, Richard Chenery became engaged as an importer and jobber of wines and liquors in the firm Chenery, Souther & Co., located at 311 Clay Street. By 1873, the business had moved to 215 and 217 California Street. It was reported that the bottling of their “various brands of family liquors, put up specially for the drug trade, this being with them a specialty – the large and increasing demands in this branch of business an indication of their popularity with the Apothecaries.” They also imported Cedar Run Bourbon Whiskey from Kentucky and sold a variety of wines. Chenery married the daughter of the last Whig governor of the State of Maine, Ann Marie Crosby, in 1873. They soon had a son, Horace, born in San Francisco in 1874. But, more family tragedy was yet to come. The 12-year old son from his first marriage, Richard, Jr, died in San Francisco in November 1876, and another son, Charles Eugene, born in Spring Prairie, Wisconsin, died one month later at the age of 35. A final son born in Massachusetts in 1846, Leonard, lived a full life, graduating from the US Naval Academy and retiring from the Navy as a Lieutenant Commander. He died in 1901. Richard Chenery died suddenly of heart disease in Belfast on July 27, 1890 at the age of 73. The accomplishments achieved by this one individual during a single lifetime, with an ability to simultaneously juggle a variety of businesses and activities, seem almost superhuman. He was a true California pioneer, a Forty-Niner among the first wave of emigrants to make the dangerous trip to the Pacific coast. He rapidly found wealth not by toiling at the mines but rather in the transportation and sale of the supplies that kept the Gold Country going. When Chenery Street was named for Richard Chenery in 1865, he was an honored and respected citizen. His subsequent omission from the classic texts describing the origin of San Francisco street names is a complete mystery. 1. Official Opinions and Communications of Franklin K. Lane, City Attorney of the City and County of San Francisco, State of California. City and County San Francisco. July, 1902. 2. Block EB. The Immortal San Franciscans for Whom the Streets were Named. Chronicle Books: San Francisco. 1971. 3. Municipal Report of San Francisco, 1909-1910. Neal Publishing Co., San Francisco. 1911. 4. Cutter, WR (ed). Genealogical and Personal Memoirs Relating to the Families of Boston and Eastern Massachusetts. Vol. III. Lewis Historical Publishing Company: New York. 1908. 5. US Federal Census, 1840. Available at Ancestry.com. 6. 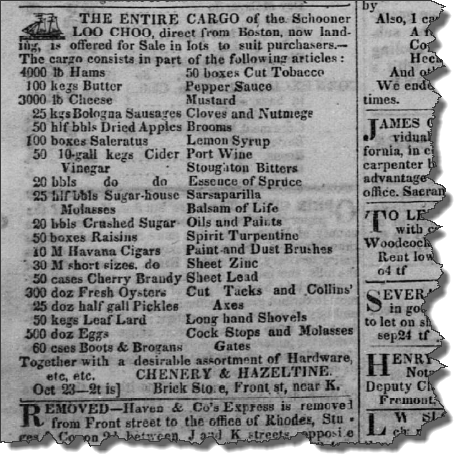 Milwaukee Sentinal, July 30, 1839. Available at NewspaperArchive.com. 7. Charles Graves Starkweather: Stockton Rancher. 8. Sacramento Daily Union, and Sacramento Transcript. 1850 – 1865. Available at the California Digital Newspaper Collection. 9. Reports of Committees of the US House of Representatives and Court of Claims, Made During the Third Session of the Thirty-Seventh Congress. 1862-1863. 10. Nash GD. State Government and Economic Development. Institute of Governmental Studies: University of California, Berkeley. 1964. 11. The Eighth Session of the Senate of the State of California, Begun on the Fifth Day of January, One Thousand Eight Hundred and Fifty-Seven, and Ended on the Twenty-Ninth Day of April, One Thousand Eight Hundred and Fifty-Seven, at the City of Sacramento. Sacramento: James Allen, State Printer, 1857. 12. The Richmond Times Dispatch, March 6, 1861. 13. Pony Express River Steam “Antelope.” Available at the Historical Marker Database. 14. Register of the Commissioned, Warrant, and Volunteer Officers of the Navy of the United States, Including Officers of the Marine Corps and Others, to January 1, 1863. Washington: Government Printing Office. 1863. 15. Report of the Secretary of the Treasury on the State of the Finances for the Year 1863/1864. Washington: Government Printing Office. 1864. 16. Peck Ira B. A Genealogical History of the Descendants of Joseph Peck. Facsimile Reprint, Heritage Books, Inc: Bowie, MD. 2001. 17. The Last of Billy Mulligan. New York Times, August 11, 1865. 18. Arrival of the Ocean Queen. New York Times. October 12, 1865. 20. Langley HG. San Francisco City Directory. San Francisco: Commercial Steam Presses, S D Valentine & Sons. 1873. 21. Price J and Haley CS. Business Manual and Buyer’s Guide, Being a Description of the Leading Houses, Manufactories, Inventories on the Pacific Coast. Francis & Valentine, Steam Book and Job Printing Establishment: San Francisco. 1872. 22. Williamson J. History of the city of Belfast in the state of Maine, Vol. 2,1877-1913. Loring, Short, and Harmon: Portland Me. 1913. --This article was originally published in 2012 on Tramps of San Francisco. It is printed here with permission.